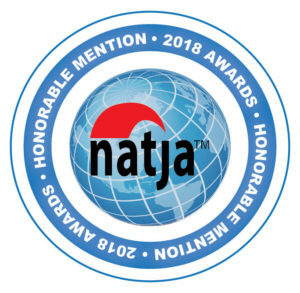 At the beginning of the year, I won the travel giveaway from Carmen’s Luxury Travel, which included a $50 American Express gift card and Lonely Planet’s Best in Travel 2017. Little did I know, I would be going to one of the guide’s “best of” regions – the Skellig Ring in Ireland – later that year. After driving the Skellig Ring twice, yes, twice, I have to say they are spot on! This is a MUST do in Ireland! Disclosure: You can help support my small town travels by using the affiliate links in this post, at no additional cost to you. 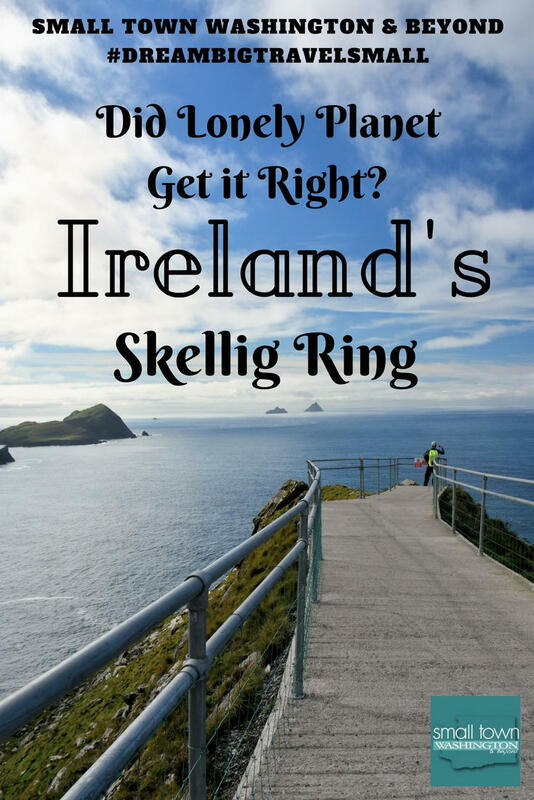 Now, you might be asking, what is the Skellig Ring? It is an extension of the 111-mile Ring of Kerry drive, which is a very popular drive in County Kerry. The Skellig Ring is an added route around 20-miles long. Along the way, you’ll experience breathtaking views of the Atlantic Ocean and rugged coastline, Kerry Cliffs, and the Skellig Islands. You’ll also see beaches, castles, churches, tombs, small towns, a famine village, taste famous chocolate, and see some of the filming locations for Star Wars. While the drive is only 20 miles long, you’ll want to set aside a good chunk of time (I’d recommend at least 4-6 hours) as you’ll want to make stops along the way and you don’t want to feel rushed. In the map below, the drive is noted in red, and it also has a route on Valentia Island. When embarking on the Skellig Ring drive, I suggest staying at a location near the route. The closest towns on the Ring of Kerry are Cahersiveen and Waterville. On the drive itself, I would suggest staying in the towns of Ballinskelligs, Portmagee, and Knight’s Town. I stayed in Waterville twice, once at the Butler Arms Hotel and once at the Sea Lodge Hotel. Each offers different experiences, and I highly recommend both. If you are looking for historic charm stay at the Butler Arms Hotel. If you prefer a contemporary ambiance, stay at the Sea Lodge Hotel. And, if you are Star Wars fan, the cast stayed at both of these hotels. The town of Waterville hugs Ballenskelligs Bay and has picturesque views. It’s a small town, with around 500 people. I was there in October, and it was pretty low key, but I was told that in the summer season it turns from a sleepy village to a busy beach town. You’ll find Waterville has everything you’d need – restaurants, pubs, grocery store, and a variety of lodging options including B&Bs. The town is very walkable, and they also have famous golf courses and fishing. Waterville was also one of Charlie Chaplin’s favorite places and is the home of the Charlie Chaplin Comedy Film Festival. And, if you are looking for some culture (movies, plays, music), check out the schedule at the Tech Amergin Community Arts & Education Centre. 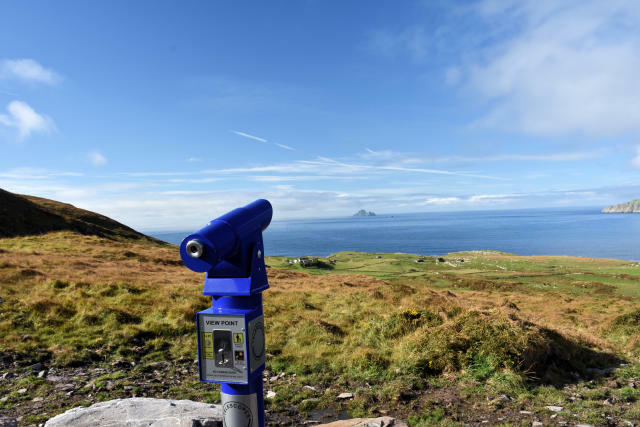 If heights and sea travel doesn’t bother you, and you want to see an ancient monastery on an island, or are a Star Wars fan, you’ll want to put a Skellig Island Landing Tour on your itinerary. Landing tours on the UNESCO World Heritage site Skellig Michael are very popular, and visitors walk up 600 steps to an ancient monastery with beehive huts. The landing tours run May to October, so you’ll need to plan in advance as they book up fast. There are also non-landing tours that run March to November and go around the islands where you can see birds (puffins, gannets, arctic terns just to name a few), the steps, the beehive huts and the lighthouse. The tours are weather dependent, especially the landing tours, so be prepared that it might get canceled. It’s also important to note that the landing tour is not for everyone. If you have small children or have issues with height, you probably do not want to choose this as the stairs are very, very steep and there are 600 of them. The best way to see if it is a good fit for you or your family is to visit The Skellig Experience Visitor Centre, which is on Valentia Island. Remember how I said I drove the Skellig Ring twice? I had planned to go out on a hosted tour with Skelligs Force Awakens Boat Tours, but the weather did not work in my favor. Instead, I got a personalized tour of the Skellig Ring with David Walsh, the captain of the boat. Having lived his whole life in the area, he knew a lot about its history and introduced me to many people, like the owner of Skelling Chocolates, the director of The Skelling Experience Visitor Center, and his sister, who works at the Tech Amergin Community Arts & Education Centre. I had a great day and enjoyed meeting David and the people who live in the area. When I return to Ireland, I hope the weather is good so I can go out on his boat The Force Awakens. To book a tour with them call the number below or visit their website. They leave from the dock in Ballinskelligs, which is an 18-minute drive from Waterville. Now the basics are out of the way, let’s talk about driving the Skellig Ring. I drove in a clockwise direction, starting from Waterville and making my way to Portmegee, where I extended my drive onto Valencia Island. These are the stops I made along the way. This castle is also called McCarthy Mór Castle and is a tower castle. Built in the 16th century, they believe it was built to protect the bay from pirates and served as a place to collect taxes on items that boats brought in. This spot has ample parking, and there is a beach, a small cafe, as well as public restrooms. To see the castle you can walk onto the beach, or walk out to the castle. It can be a little bit of a walk, especially if the tide is in, but once you get there, stairs lead you up to the second floor where you can walk along the wall. Travel Tip: Near the parking lot is a cafe and public restrooms. A short drive away is the popular Cable O’Learly’s Pub and Restaurant and the seasonal The Atlantic Grill, a food truck that specializes in fresh fish dishes. The first time I visited Ballinskelligs Abbey we drove out to the site, but the road is narrow and parking pretty much non-existent, which makes turning around difficult. 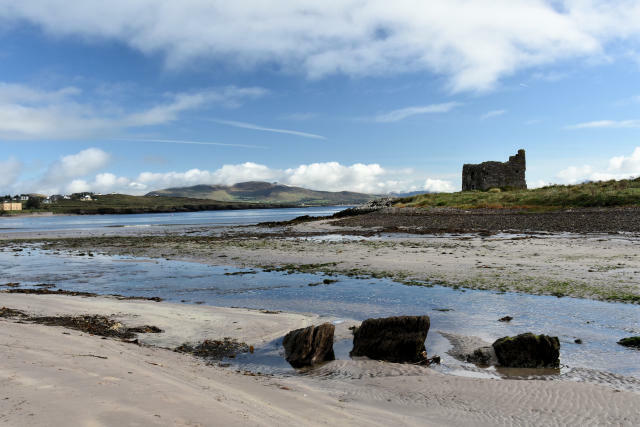 If you are up for more of a walk, take the trail from Ballinskelligs Castle to the abbey. I did this my second time, and if you are a walker, this is the way to go. The abbey is from the 12th century and the home of the monks who fled Skellig Michael after numerous Viking attacks. Some buildings are built later, like the 15th-century priory and a rectangular church. There are lots of tombs and gravestones, some are recent, and if you ask me, it is a beautiful place to be buried. Travel Tip: If you hike from the parking lot to the castle and the abbey give yourself an hour or so. It all depends on how fast you walk and how long you linger in each place. I list these stops as optional as the roads to them are off the main road and narrow. Most Americans will find the roads in Ireland narrow, but these are more so. Again, I put these destinations on my phone and had it guide me. Out of the two, the famine village is the easiest site to get to. 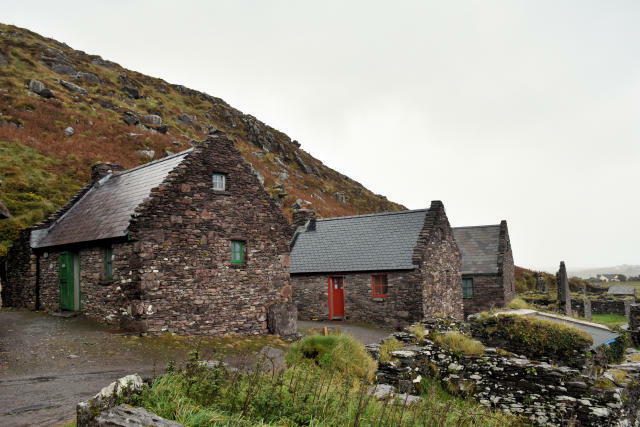 It has been turned into an artist retreat and called Cill Rialaig. Artists have to apply to stay in one of the cottages. While you can drive here, the parking is private, so it would be a quick stop and turn around. This road will also take you to the Kildreelig early Christian site. The road from here on is super narrow. You’ll really feel like you are on the edge of the world. The site is not marked, and there is no designated parking. I drove a little past the site and found a farmers road that went uphill. I backed up into that so I could pull out and go the right direction back down the road. There is not much to see at this site as the ruins sit on a slope which it is fenced off, but the view is impressive. If I had to do it over again, I’d forgo this stop. From here you’ll want to take the road back to the Skellig Ring road. Unfortunately, I missed the tomb on the drive. Driving alone and on the opposite side of the road has its drawbacks as you can miss markers along the way. If you want to see pictures of the tomb check out this website. Skelligs Chocolate is a fun stop along the drive as it is working chocolate factory. You can enjoy free samples, watch workers as they make chocolates, buy chocolates and during the season The Puffin Cafe sells hot drinks and light snacks, like scones and cake. Travel Tip: Give yourself 15 to 20 minutes here, maybe longer if you decide to have a snack. There are two stops here, the Glen Church Ruin and Cemetery and the bay which has views of the Skellig Islands. I opted to skip the ruins and check out the beach and the surfer. Travel Tip: There are a few picnic tables here if you want to enjoy your Skelligs Chocolates with a beach view. This is one stop you do not want to miss. The drive includes switchbacks up a mountain slope and then heads back down into a valley, and the cliffs are about midway. If you are going in a clockwise direction, they will be on your left and easy to find as there are a couple of signs. The Kerry Cliffs are 1,000-foot sandstone cliffs, and the views from the viewpoint are amazing. Visitors park in the parking lot, pay 4€ per person, and then hike to edge of the cliffs and the viewpoint areas. During certain times of the year, birds roost on the cliffs, and there are informative plaques about different species at the viewpoint areas. In October, I didn’t notice any. Travel Tip: Give yourself at least 45 minutes to an hour. If you get winded there are some benches to rest. Unfortunately, I didn’t have enough time to walk around the fishing town of Portmagee, but it looked like a charming small town, and I would have loved to have checked out the restaurants. Additional boats leave for the Skellig Islands from here, as well as Valentia Island. View of Portmagee from Valencia Island. From Portmagee, is a very short bridge to Valentia Island. Almost right on the other side of the bridge is The Skellig Experience Visitor Centre as well as additional boat tours. As I mentioned before, the center is a great stop if you want to learn more about the island and if the trip out there is right for you. The centre has exhibits on the islands, the wildlife, monastery, Viking raids, and lighthouses. There is also a 20-minute video you’ll want to be sure to watch. There is also a cafe with freshly made food and with views of Portmagee. If you are in need of a stop on your Skellig Ring drive, this is a great place to take a break and fuel up. And, if you are going to drive Valentia Island it is a great place to stop for the night, and then tour the island in the morning. 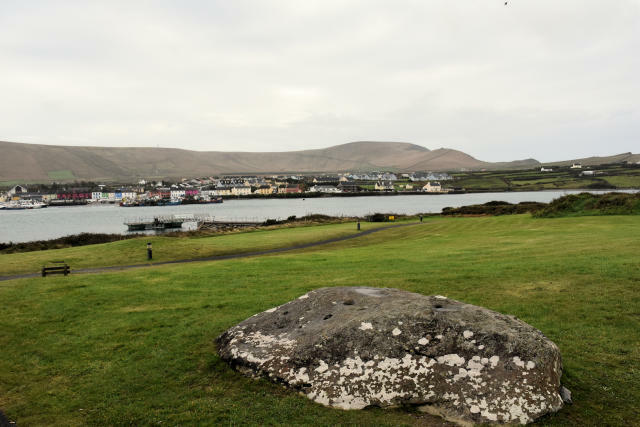 If you want to pack both drives in into one day (which I did, but felt a little rushed), I’d arrange to stay the night Valentia Island in Knights Town, as that is close to some of the attractions on that side of the island. If you decide to end your Skellig Ring Drive, from Portmagee, continue on the road until it reaches N70 and reconnects with the Ring of Kerry. Want to continue your drive? 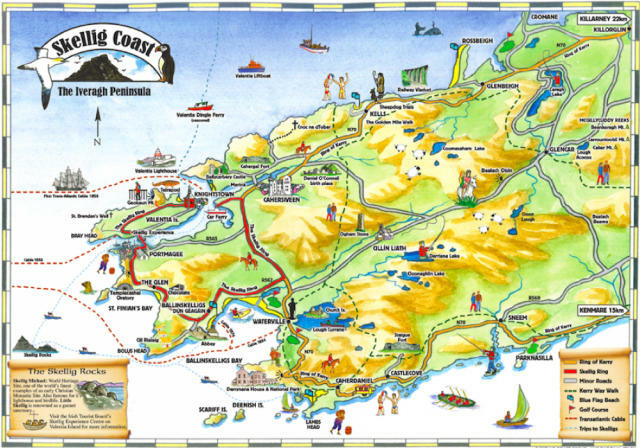 Check out the route on Valentia Island HERE. For more information on the Skellig Ring visit the Wild Atlantic Way or Visit Ireland. To stay at the hotels in Waterville visit the Butler Arms Hotel and Sea Lodge Hotel. 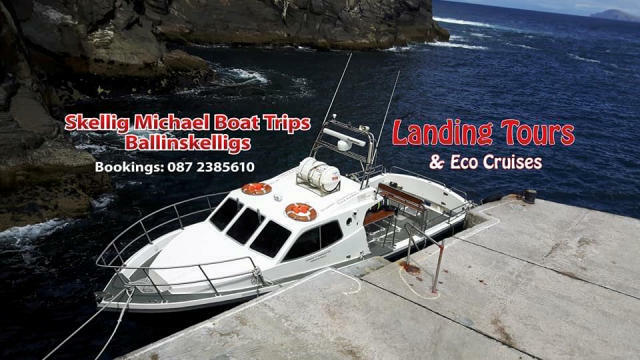 To book a tour with the Skelligs Force Awakens Boat Tours, visit their website. 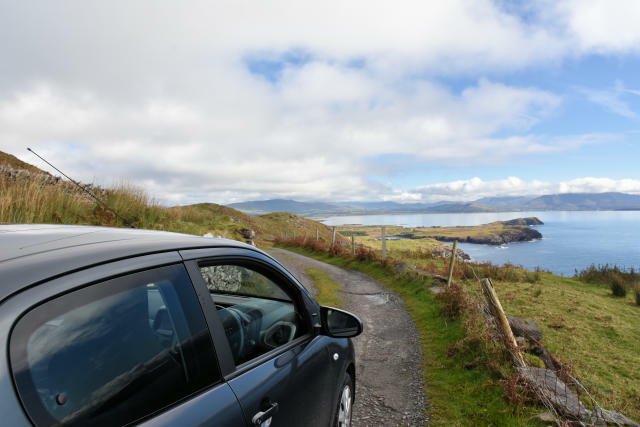 Getting Around: After spending ten days in Ireland on a solo trip, I have come to the conclusion that car is a must as there are so many off-the-beaten-path locations you’ll want to visit. Also, driving in Ireland is an art. If you want to experience Ireland and the Skellig Ring at your own pace, driving is the best way. On this trip, I partnered with Auto Europe and picked up my car at their Shannon Airport Location. They work with all major car rental companies to get the best deal. Plus, they always find automatics which I needed as I don’t drive a manual. They have lots of great Ireland road trip ideas here. Ireland is breathtaking and unbelievably picturesque, Lara. The Skellig Ring seems like a definitely worth visiting place. When would be the best time of the year to explore Ireland on a road trip? Agness, The first time I went to Ireland was in April, as that is when they said it was a good time to go. I had lots of great weather days. This time I went in October, and there was a mix of rainy and sunny. But, I’d be prepared for rain or sun any time of year. One thing about going in the offseason is that you have more choices for accommodations. I hadn’t heard of the Skellig Ring Drive before but I’m beginning to collect information for my own trip to Ireland (hopefully next year!). I do love how beautifully rugged it is. The landscape is so unlike anything I’ve seen in the states. Love your photos and videos! Tami, You are going to love Ireland! Tami, Thank you. I hope your Ireland trip falls into place next year. It is such an amazing place. Wow! I have always wanted to go to Ireland, and now I have another activity to add! Ireland has been on my bucket list for as long as I can remember. I had thought of going to TBEX simply because of where it was held. It looks like you explored the best of Ireland. Cant’ wait to see those views for myself! Tonya, You are going to love it. Beautiful photos and slideshow, Lara! What a fantastic trip! I haven’t been to Ireland but would love to add this to my list! Thanks for sharing the Skellig Ring drive! Debbra, Ireland is such a captivating place. You’ll love it! Too much gorgeousness! And as much as I want to see those cliffs, I really want to visit the Skellig Chocolate factory! You’re right, Lonely Planet got it right. Jillian, Ha! The chocolate is so good! This looks like a great trip! I love the lush green countryside. And sign me up for that chocolate 🙂 I’ve been to Ireland twice and somehow managed not to leave Dublin. I’m due for another visit, and definitely need to check this out! Megan, Yes! Go back and check it out! Ireland is such a beautiful country, we visited earlier this year and definitely want to go back to explore more. Had not heard about the skellig ring drive. But it looks like I should look into it for our next Ireland roadtrip. Jules, It does not disappoint. I hope you get to go back and drive it! What a beautiful drive! I want to go to Ireland very badly, but so far it didn’t work for me. Every time we make plans for it, something goes wrong. I’m glad to hear you won the travel giveaway. Aw, so glad you won that giveaway! How cool you traveled somewhere in the book 🙂 Stunning photos, thanks so much for sharing! Oh what a beautiful set of images! I drove the Ring of Kerry on a teenage trip with girl friends, one of our first without adults for all of us, and we loved it. Not sure we did the Skellig Ring though, so a good excuse to go back, especially since my husband loves road trips. Plus I need to see the beehive huts for myself! Skellig islands: now top of my list. That hike looks awsome! I’ve always wanted to visit Ireland and this area looks so picturesque! Loving your photos! The Skellig Ring seems to capture the spirit and beauty of Ireland wonderfully. The drive and the places that are strewn like gems on the route are so fascinating. The Chocolate factory is one stop I would definitely make and taste some of the Skellig chocolate and also watch the workers making chocolate. The pictures are stunning 🙂 I so want to pack up my bags and leave for Ireland right now. What a gorgeous place to go driving! The sea cliffs look absolutely beautiful. I definitely have to go there. Mary, I hope you get to drive it! My new coworkers are from Ireland and I’ve heard nothing but great things from there as of lately. That footage you captured at Kerry Cliffs is absolutely stunning! Guess Lonely Planet really knows what they’re talking about! Will have to download that Skellig Ring map too for my visit here someday. Jas, You’ll love Ireland. It is so beautiful, even when it rains. Speaks right to my heart this does. I love road trips and I love Ireland. I’ve never been to this part of Ireland though and it looks simply gorgeous. I would love to visit the Ballinskelligs Castle in particular and the Famine Village! Kerri, You’ll love this part of Ireland! Your travelogue transferred me to this magical place. Such beautiful photos and equally nice description.